Anything that sprouts is live food and great for you. Here is how to sprout almond seeds and beans. 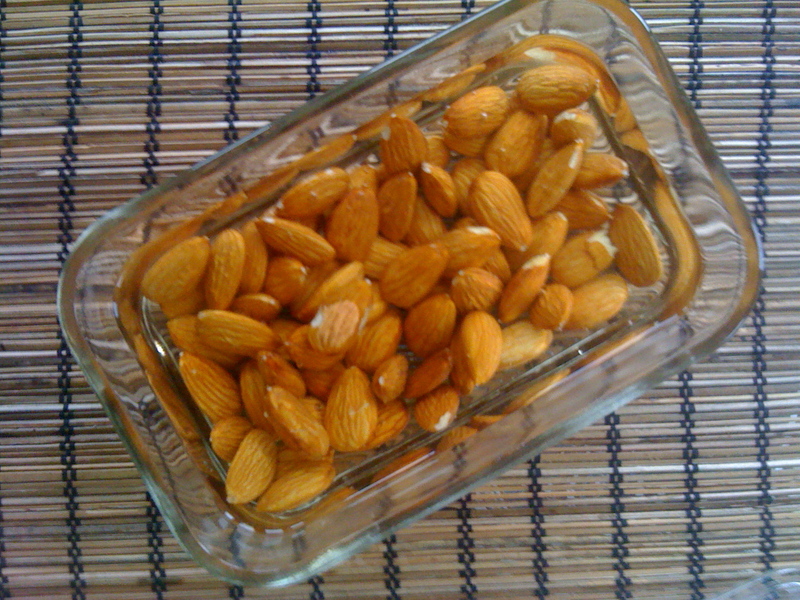 Soak raw almonds in filtered water for about a day and they will begin to sprout. After one day the water gets murky and needs to be changed for the almonds to keep well. You may have to change it twice. These I just put in the water. 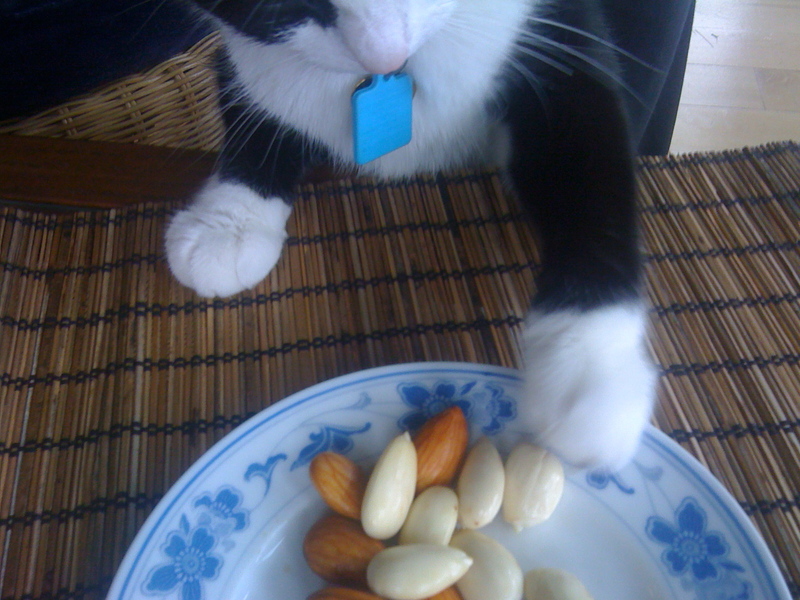 You can keep the almonds in the cold water up to 3 days before eating. The skin slips off very easily once they are soaked. See below. This can also be done with walnuts halves however I add a little salt to the water and then rinse before eating, to remove the bitterness of the skins, which cannot easily be peeled off. Also change the water. 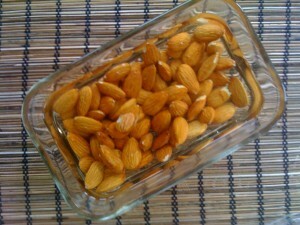 It is also good to soak your beans, as it lessens the gas and speeds the cooking. Change the water at least once a day and use filtered water, otherwise they will taste like chlorine. If you soak the beans about 2-3 days they will begin to sprout. At this point you can decide if you want to continue to sprout them to eat raw or cook them. 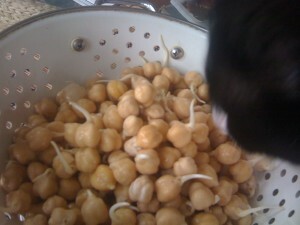 I usually set aside some sprouted beans for salads. After 2 days soaking in water the chick peas sprouted, then by themselves, out of water, continued to grow on day 3 in the colander. If you cook them, the skins will fall off easily, for making humous I usually try to take out the skins, as they are harder to digest. I find using the colander to grow them in keeps them from getting moldy, and usually they just need to be rinsed 1-2 times a day to re-hydrate them as they sprout. 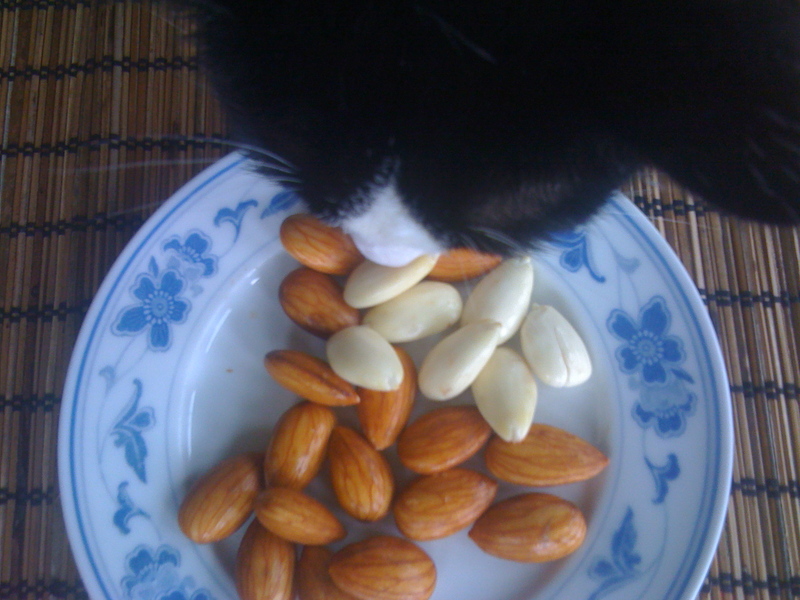 This entry was posted in Delicious and simple food, Vitality and love and tagged chick peas, raw food, soaked walnuts, Sprouting almonds, sprouting beans, vegetarian food. Bookmark the permalink.